Stars from the 1930's - Frisch, Traynor, Gehringer, Cochran, Ott, Gomez, plus Carl Hubbell vs Foxx, Ruth and Gehrig in the 1934 All-Star Game. Johnny Vander Meer pitches 2nd consecutive no-hitter! Ted Williams' three-run HR wins 1941 All-Star Game! Enos Slaughter's winning dash from first to home scores winning run in the 1946 World Series! Cookie Lavagetto's double breaks up Bill Bevens' no-hit bid in the 1947 World Series! 1938 & 1939 World Series - Mostly 1938 with Yanks beating Cubs and Dizzy Dean: Red Ruffing, George Selkirk, rookie Joe Gordon, Frank Crosetti, Tommy Henrich and Myril Hoag. 1939 - Game 4 at Crosley Field: rookie Charley Keller, Joe DiMaggio, Bill Dickey plus Ernie Lombardi's famous "snooze" at home plate as DiMaggio scores winning run from first! 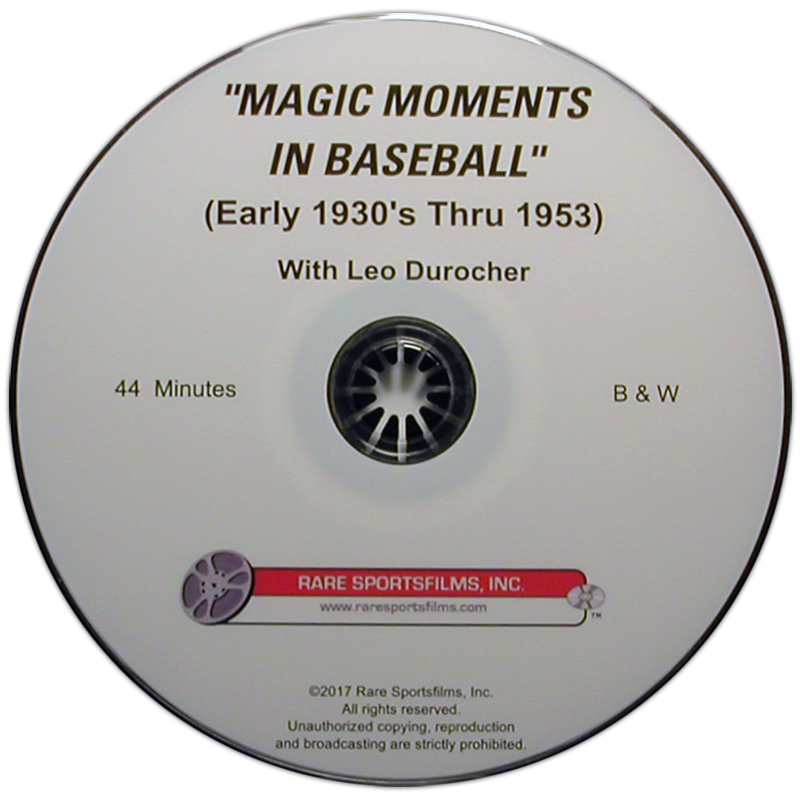 1941 Highlights of the Year & 1941 World Series - Gehrig dies, DiMaggio's batting streak (breaks old record by hitting in his 42nd. consecutive game at Washington). All-Star Game at Detroit (Arky Vaughn's homer and Williams' game-winner)! 1941 World Series - Managers McCarthy and Durocher, Game 1 at Yankee Stadium, Joe Gordon's HR off Curt Davis. Bill Dickey, Charlie Keller vs Pee Wee Reese, Mickey Owen, Lavagetto, Lew Riggs and Jimmy Wasdell. Red Rolfe's great DP on Reese at third! Game 5 at Ebbets Field, Whitlow Wyatt vs Ernie Bonham. A wild pitch by Wyatt and single by Joe Gordon score two in the Yank second. Henrich's HR in the 5th pads Yank lead. Wyatt scores on a sac fly in the third for only Brooklyn run, and Yanks clinch, 4 games to one! 1942 World Series - Game 1 at Sportsmans Park, Ruffing vs Mort Cooper. Heavily favored Yanks build up 7-0 lead thru 8 innings, and Ruffing gives up only 1 hit thru 8 innings, but in the ninth, Cards score 4 runs and have Musial at bat with the bases loaded, but rookie Stan grounds out, ending 7-4 Yank win. Game 5 at Yankee Stadium - Rizzuto starts Yank first by slamming HR. Slaughter's round tripper ties score 1-1 in the 4th. With game deadlocked 2-2 in the ninth, Whitey Kurowski's two-run HR provides winning runs as St. Louis prevails 4-2 and wins, four games to one! 1943 World Series - Game 1 at Yankee Stadium, Spud Chandler vs Max Lanier. Tied 2-2 in the sixth, game turns on singles by Crosetti, Billy Johnson and Dickey, plus wild pitch by loser Max Lanier, as Yanks win 4-2. Home run, Joe Gordon. Game 5 at Sportsmans Park - Spud Chandler vs Mort Cooper. Keller's 6th Inning single and then Bill Dickey's two-run HR gives Chandler all the runs he needs for 2-0 shutout in World Series clincher! It's Bill Dickey's last W.S. game as a player. 1947 World Series - Game 4 at Ebbets Field - Dodger hero Cookie Lavagetto's pinch-hit double ruins Bill Bevan's no-hitter in the last of the ninth and wins the game for Brooklyn! Game 5 at Ebbets Field - Next day, ninth inning, almost the same situation: Dodgers trailing by a run, have tying run at second and two outs and yesterday's hero Lavagetto again pinch-hitting. But Cookie strikes out vs Joe Page to end game and Yanks win to take 3-2 series lead back to the Bronx. Game 6 at Yankee Stadium - In front of largest World Series crowd in Yankee Stadium history (74,065) another Dodger is hero of the game! Here's a new angle of Al Gionfriddo's famous game-saving catch, with DiMaggio kicking up dirt in disgust! 1948 World Series - Game 1 at Braves Field, Johnny Sain vs Bob Feller - Feller loses 2-hit heartbreaker 1-0, on walk, a sacrifice and RBI single by Tommy Holmes. Game 2 at Boston, Bob Lemon vs Warren Spahn. Fourth inning hits by Boudreau, Gordon and Doby score two, knock out Spahn and put Tribe in front for good. Game 5 at Cleveland, Nelson Potter vs Bob Feller. Bob Elliott's two homers off Feller, good for 4 RBI, doom Feller to another W.S. loss and help Braves to 11-5 win, sending series back to Beantown. Game 6 at Braves Field, Bob Lemon vs Bill Voiselle. Joe Gordon's solo HR in 6th gives Cleveland the lead for good on way to 4-3 Series ending victory. 1950 World Series - Game 1 at Shibe Park, Raschi vs Konstanty. Yanks score game's only run in the 4th on sac fly by Jerry Coleman. Game 2 at Shibe Park, Reynolds vs Roberts. With game tied 1-1 in the 10th inning, Joe DiMaggio smashes Roberts pitch for HR to win game for Yanks. Game 4 at Yankee Stadium, Whitey Ford vs Bob Miller. Ford takes 5-0 shutout into the 9th, but Phils score two unearned runs knocking out Ford. Reynolds comes in to shut the door and Yanks win 5-2, to take the series in 4 straight. 1951 Bobby Thomson's Home Run - Leo is right in the middle of this one! Final game, '51 N.L. Pennant Playoff at the Polo Grounds - Three-run Dodger uprising in the 8th vs Maglie gives Brooklyn 4-1 lead, but Giants come back in the last of the 9th and with a run in and two men on, Bobby Thomson is up (you know the rest). In victorious Giant's clubhouse, Larry Jansen and Thomson joyfully talk to reporters. Then Durocher tells scribes how he feels and what he thinks of the Dodger ballclub! Stengel's Sluggers - A look at the powerhouse Yankee teams of the early 1950's. 1951 Spring Training at Phoenix and then the '52 W.S. with Johnny Mize, Jerry Coleman, Phil Rizzuto, Yogi Berra, Ed Lopat, Joe DiMaggio, Vic Raschi, Allie Reynolds, Gene Woodling and Mickey Mantle. 1953 World Series - Gilliam, Hodges and Shuba home runs shown, as well as Carl Furillo's 9th inning blast that tied the 6th game 3-3! But Billy Martin is the hero of the series, with series-winning RBI in last of the ninth of Game 6. Martin bats .500 with 2 HR, 2 triples, 8 RBI's and a new record 12 hits! Action from the opener and Game 6 shown. Babe Ruth Feature - Starting with pitching for the Red Sox, thru batting for the Braves and Babe Ruth Day at Yankee Stadium, 1948. Three home runs shown, 1923 World Series shown including nice shots of mgr. McGraw. Crowned "King of Swat" with Manager Huggins, plus sparring, kicking football and with kids.